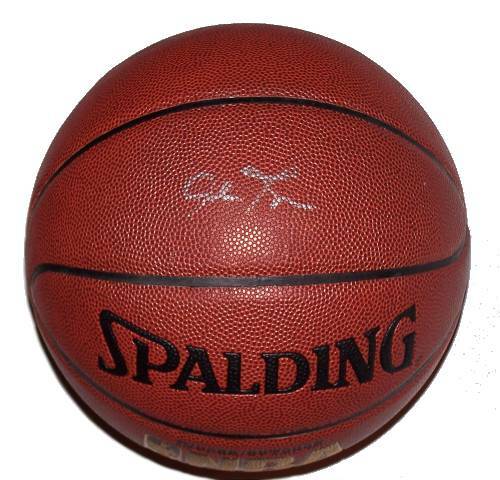 A Spalding NBA basketball signed by Allen Iverson, formerly of the Philadelphia 76ers. Comes with a Certificate of Authenticity. Allen Iverson is an American professional basketball player for Besiktas in the Turkish Basketball League and the Eurocup. He was selected by the Philadelphia 76ers with the number one pick in the 1996 NBA Draft. He was named the NBA Rookie of the Year in the 1996?97 season. 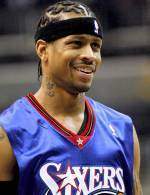 Iverson is an eleven-time NBA All-Star which includes winning the All-Star MVP award in 2001 and 2005. Winning the NBA scoring title during the 1998?99, 2000?01, 2001?02 and 2004?05 seasons, Iverson has become one of the most prolific scorers in NBA history. His regular season career scoring average of 26.7 points per game ranks sixth all-time, and his playoff career scoring average of 29.7 points per game is second only to Michael Jordan. Iverson was also the NBA Most Valuable Player of the 2000?01 season and led his team to the 2001 NBA Finals the same season. Iverson represented the United States at the 2004 Summer Olympics, winning the Bronze medal. He also played for the Denver Nuggets, Detroit Pistons and the Memphis Grizzlies, before returning to the 76ers for part of the 2009-10 season. ~ Wikipedia.